Catherine Russell, dubbed the "Cal Ripken of Broadway" by People Magazine, originated the role of Margaret Brent and has played every performance but four since the play opened in April of 1987 which recently earned her a spot in the Guinness World Records. She debuted Off-Broadway in 1980 as Nicola Davies in Stephen Poliakoff's City Sugar and has also appeared Off-Broadway in Miss Shumann's Quartet, A Resounding Twinkle, The Award And Other Plays and Creeps. She has also appeared in New York as Masha in Three Sisters, Rose in Incommunicado, Edie in The Lunch Girls, Missy in Home On The Range, and Cathy Cakes in Inserts. While performing in Perfect Crime, she has also managed to appear on-stage (after 10:30pm or on her nights off) in The Queen of the Parting Shot, Pas de Deux, Stages, I'll See You In Hell, Guardian Star and, most recently, Some Enchanted Evening as well as several films including Soundman and Remedy. She teaches acting at NYU, is the General Manager of the Theater, and is also one of the executive producers of The Fantasticks, playing downstairs in the Jerry Orbach Theater. She dedicates her performances to the memory of her beloved dog Clementine, who, like her "mother" almost never missed a performance of Perfect Crime. In 1984, Steve made his Broadway debut in the shortlived revival of The Three Musketeers directed by Tom O’Horgan. He then starred as Lancelot opposite Robert Goulet as Arthur, in the revival of Camelot. He is most known for being the longest running Beast in the history of Disney’s Beauty and the Beast on Broadway, portraying the character for over eight years. Off-Broadway, Steve created the role of Johnny in Johnny Guitar, The Creature in Frankenstein, and Captain Smollett in Treasure Island, directed by B.H. Barry. National Tours include Joseph Pulitzer in Disney’s Newsies, King Triton in Disney’s The Little Mermaid, The Phantom in Ken Hill’s Phantom of the Opera, Miles Gloriosus in A Funny Thing Happened on the Way to the Forum starring Mickey Rooney, and Pa in Little House on the Prairie opposite Melissa Gilbert as Ma. In Television, he’s appeared on House Of Cards, Madam Secretary, The Good Fight, Law & Order, Ed, Third Watch, Police Story, and Sunset Beat. He can be heard on the original recordings of Johnny Guitar, Sundown, Frankenstein, and his own CD, Northbound Train. 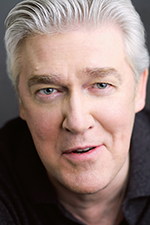 David Butler has performed for many years in film, television and on New York and regional stages. Some theater productions include Criminal Hearts at Stamford Theatre Works; American Buffalo, Talk Radio, Glengarry Glen Ross and Fool for Love at The New City Theater; Burn This, Speed the Plow and Habitation of Dragons, written and directed by Horton Foote, at the Pittsburgh Public Theatre, among many others. He has also helped develop a variety of new and original works, including The Woodsman at The Actors Studio Theater; Dead Father’s Club at the Performing Garage and The Einstein Project at Theatre of the First Amendment in Washington DC. Television credits include Law and Order; America’s Most Wanted; Law and Order: Criminal Intent; Third Watch; National Lampoon’s Seven Deadly Sins: Thy Neighbor’s Wife, directed by Denis Leary, and appearances on several soaps, including One Life to Live and Days of our Lives. Film credits include The Professional, Cop Land, New Jersey Drive, Night and the City, Silence of the Lambs; Night of the Living Dead, The Dark Half, and the original Dawn of the Dead – all directed by George Romero. Special Thanks to Warren. Broadway; Susan Stroman’s revival of The Music Man, Amazing Grace, The Bridges of Madison County, SpiderMan-Turn Off the Dark and ShowBoat on London’s West End. National Tours; Grand Hotel, The Will Rogers Follies, Seven Brides and Marie Osmond’s The Sound of Music. Off-Broadway; The Fantasticks, Captains Courageous, Lone Star Love, The Prince and the Pauper, Illyria and The Golden Boy of the Blue Ridge. Television; As The World Turns, HBO’s Boardwalk Empire and many national commercials. Dan currently sits on the board for Amazing Place Music based in Whitefish, Montana. Enjoy the show. Robustelli appears on video tape in Perfect Crime, but he has been working on Broadway since he was fifteen years old selling orange juice and lemonade at the Lunt-Fontanne Theatre. He then moved next door to the Edison Hotel where he performed behind the desk for 24 years. Recently he appeared as Tom's voice in the Off Broadway play Guardian Star and is looking forward to actually appearing on-stage in person in his next show. He is dedicating his performance to the memory of his mother Helen, who worked on Broadway for fifty years as head usherette at the Royale Theatre.